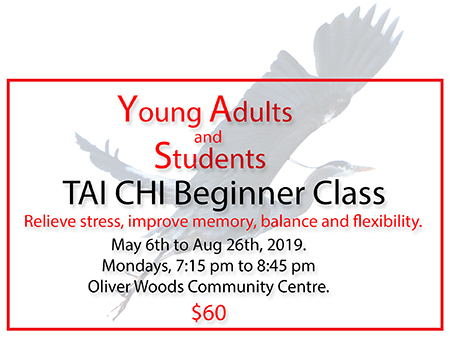 Tai Chi Nanaimo..Tai Chi for Life! 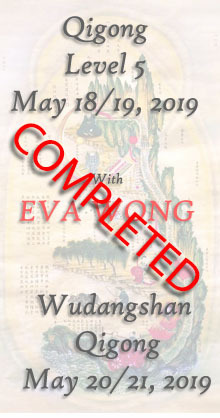 We practice the 108 move health-oriented tai chi set, through our not-for-profit, non-religious volunteer-run organization. Tai chi is a complete whole-body exercise that can be practiced anywhere, anytime, at any age, with no need for special gear or clothing. Our accredited volunteer instructors teach Beginners and Continuing classes. Beginner classes run for approximately three months, after which participants can join an on-going class. 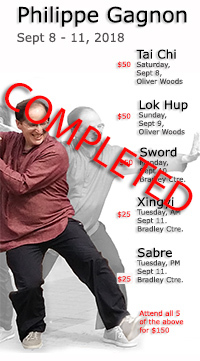 We also practice Lok Hup, Tai Chi Sabre, Tai Chi Sword, Xingyi, and Qigong. Annual Membership: $10. For those joining after July 1st, the fee for the remainder of that calendar year is reduced to $5. FEE STRUCTURE AS OF SEPT 1, 2018. Annual membership: $10/$5 (see above). Beginner classes (about three and a half months): $60. 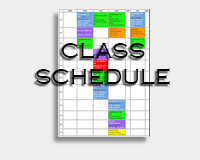 Activity fee for continuing classes: $60 per three months. Continuing students have the option to pay $200 per 12 month period. Activity fees provide access to all classes and instruction after beginners classes and/or any pre-requisites have been completed. Drop-ins are welcome, first time free to check us out. Additional fees for workshops apply but these are run at minimum cost to provide the greatest value for members. Feel free to drop in to any of our classes and speak to one of our instructors. For more information, click here..